If you want to manage your finances significantly easier, having a US bank account is the best way to do it. With a US bank account, you can deposit your financial aid, loans and money from home. Why is it recommended to have a U.S. Bank Account? Because with a bank account, you can pay all of your bills by check, and manage your bill payments online. Many banks issue debit cards with a MasterCard or Visa logo, which enables you to use the card to make purchases anywhere that accepts credit cards. What documents do you need to open a Bank Account? Enrollment verification letter from your school. Checking account allow you to deposit and withdraw money frequently and are a great way to pay your monthly bills. When you open a checking account is usually comes with checks and a bank card and allows you to use them to make purchases and pay bills. Often there is a minimum monthly balance and service fee which varies by the type of account you open. Most international students only need a checking account, which they use for managing living expenses while at school. *Be careful to keep an accurate record of every check you write to avoid extra charges for returning checks. “Bouncing” a check (writing a check for more money than you actually have in the account) is illegal and can cost you time and money. Debit Cards allow you to withdraw or deposit money to your bank account using an automatic teller machine (ATM) and to make purchases at stores that accept the card and they can be used in place of a check or credit card. Debit cards are not credit cards, however used only if you have funds in the bank. Saving accounts, these are for long term deposits for earning interest. As an international student, you will probably not need a savings account. Credit Cards, may be convenient, especially if you unexpectedly have major expenses. You must understand that you can easily accumulate large bills with credit cards, and before you know it, you may be in debt. Banks charge high interest rates if you don’t pay your remaining balance in full. How do I choose the right bank? 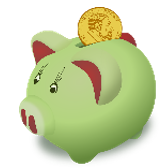 Banks offer many different financial services for students. Compare the services and costs of several banks before choosing one. Find one with a branch close to your house or the school.